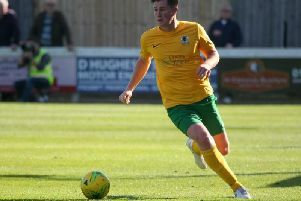 It may be all over, but Horsham’s fruitful FA Cup campaign has not only boosted the club’s coffers, it’s reminded the club of it’s potential and ‘light at the end of the tunnel’. Back in November 2007 the Hornets famously held Swansea City to a 1-1 draw in the second round of the famous competition at Queen Street in the most landmark day of their decorated history. And while they crashed out in the replay, it is a result that will live on forever in the club’s folklaw. Eleven years on the club has again just been knocked out in a replay and a lot has changed. But while Tuesday’s third qualifying round 2-1 defeat at division-higher Poole Town is nowhere near the heights of yesteryear - it has hit the right note with Horsham. Their new home at Hop Oast is begging to climb out of the ground at speed and Saturday’s ‘home’ clash with Poole at Culver Road, saw a gate much closer to the middle hundreds that the club have been used to in recent years. They banked more than £18,000 from their cup run this year with wins over Carshalton Athletic, Corinthian and Heybridge Swifts and chief executive John Lines has praised the club’s management and players for their efforts. He has revealed the money will be spent on offsetting the loss from playing home games in Lancing and spoke of encouraging signs. Lines said: “The FA Cup is traditionally an exciting time for all clubs at our level and this year has been no exception. There is always anticipation tempered by trepidation whilst waiting for the draw. “To go through a pre-qualifier and two wins in the qualifying rounds was a reflection on the fine work put in by Dom and the rest of the team. “It was unfortunate to see the run ended in a game we could, and maybe should have won, but for a series of recent setbacks in injury terms for some of the squad. “The prize money for a win this year has improved and the financial rewards will help subsidise the losses we are suffering from having to play our home matches so far from Horsham. “It excites me, however, that more than 350 turned out at Lancing for Saturday’s match. A crowd bolstered by the support and interest in the game from our youth sections. Hornets boss Dominic Di Paola also praised his players and spoke of how the successes have spurred him on going forwards. Having taken charge of the club back in April 2015, the club’s relegation fate was virtually already sealed at that time. With their 42-year stay in the Isthmian League ending, Di Paola led the club to an immediate return in a title-winning campaign the following year. There have been plenty of struggles as well; with no home ground they have not been able to run a reserve side - leading to a high player turnover - and have had limited training facilities, to name just a few obstacles. But now with the new home on the horizon, Di Paola is pleased with how the club is poised. He said: “In my time at the club we have had it quite hard. It has been really, really tough, but I can see a real positive and light at the end of the tunnel with our involvement at Horsham. “These FA runs give a taste of the future and you can see what we can achieve and what we can do. “I have a group that will give everything to the cause and I have not always had that. It’s the best group of lads I have had since I have been here at Horsham in general terms. We are going in the right direction. “Yes, there are areas to work on and improve and we are a couple of players off where we need to be, but we are improving.